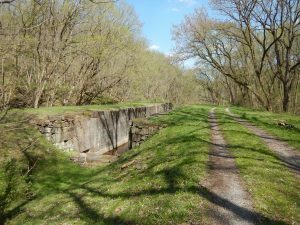 For the past 17 miles, the C&O Canal and the Potomac River has acted as the southern boundary of the sprawling Green Ridge State Forest, Maryland’s second largest forest preserve. Lock 67 marks the final official contact point with Green Ridge. A sign marks the Green Ridge Hiking Trail—19 miles to the Pennsylvania border. The forest provides many opportunities for hiking, biking, hunting, and camping. Much of Lock 67, also known as “Darby’s Lock” after its lock keeper Hugh Darby, has been replaced by concrete. A parking lot is about a quarter mile farther up the towpath and accessible from Route 51.